This is the kind of discovery literary scholars dream of but never hope to find: a cache of notations in the handwriting of Charles Dickens that reveals lost works by major authors. Bookseller Jeremy Parrott ordered a bound collection of All the Year Round, a publication edited by Charles Dickens, from an online book dealer. The listing didn’t mention any annotations, but when Parrott began looking at the volumes he realized that not only was he holding the set that belonged to Dickens himself, but that Dickens had made copious notes throughout. Like many Victorian periodicals, pieces in All the Year Round often were published anonymously or pseudonymously. The only name that mattered, after all, was already at the top of each page: Charles Dickens. In his personal edition, however, Dickens wrote in each author’s name alongside their contribution. The discovery essentially rewrites the history of Victorian literature. Elizabeth Gaskell: two new works have been discovered by the North and South author. The pair of articles on French song and poetry had been attributed to Henry Chorley. Wilkie Collins: the collection reveals eight pieces by author of The Moonstone which nobody has previously suggested were written by him. One is an article called ‘The Crusoe of the Snowy Desert’, telling the gripping true story of an explorer in the American Midwest who is stranded for a year in a barren snowy landscape and is eventually saved by a tribe of ‘savages’. In another, called ‘Hear The Postman,’ Collins argues postmen should be paid more because of their use to society. Lewis Carroll: A possible new poem has been discovered by the Alice in Wonderland author, though its provenance is still under debate. Eliza Linton: the first salaried woman journalist in Britain, is revealed to be far more prolific than first thought. Previously just a handful of pieces had been listed under her name for All The Year Round but Dickens’ notes show she wrote more than 100 articles. Misattributed: The list shows that scholars have wrongly assumed that pieces by his contemporaries were actually by Dickens. An article assigned in his collection to his son-in-law, Charles Collins, had previously been assumed to be by Dickens. The attacks yesterday were meant to do more than just “punish” particular cartoonists and writers for insulting Mohammed. They were intended to make sure others think twice about ever doing something similar. Other than craven cowardice, what possible reason could there be for blurring the Mohammed picture but not the offensive Jewish caricature? 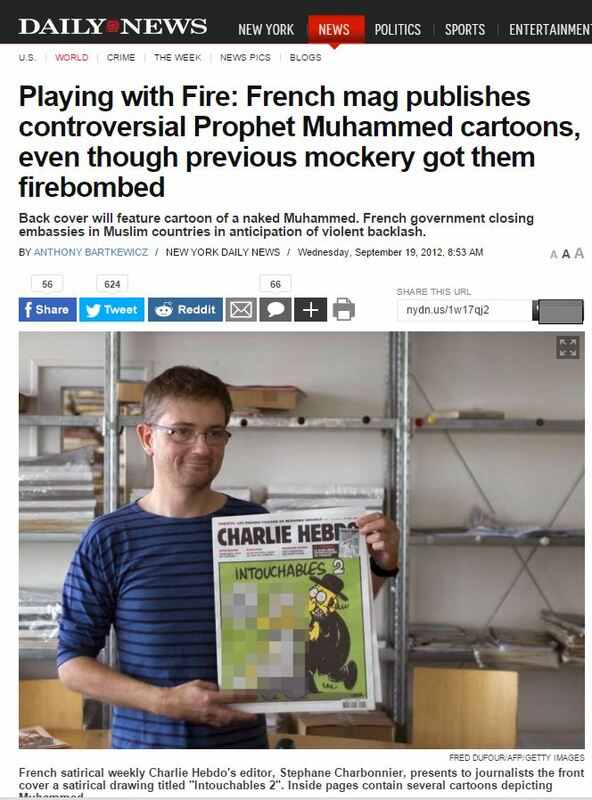 And Charlie Hebdo’s work often was offensive. I don’t agree with their anti-religious agenda, but it’s one they certainly must be allowed to express without fear. Mainstream outlets like the NY Daily News know they they can offend Jews and Christians with impunity, and so we can expect a bizarre disconnect between those criticized and mocked and held up as evil, intolerant, and violent by the elites (that would be Christians, and sometimes Jews) and the actual perpetrators of much of the mindless violence in the world (that would be Muslims). The Islamic world is certainly dominated by peace-loving people, but a statistically significant portion of them are violent savages, and we do civilization no favors by pandering to their hothouse feelings. They’re well overdue for some insensitivity training. The attacks aim at changing our behavior. Because people react in the face of violence, many will change their behavior. But since we are agents with freewill, we can choose the nature of that reaction and that change. And I choose to offend. 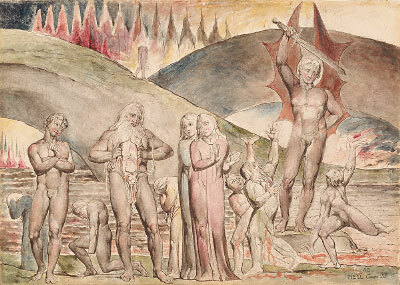 So I offer today a selection from arguably the greatest work of literature ever created by the hand of man: The Divine Comedy of Dante Alighieri. 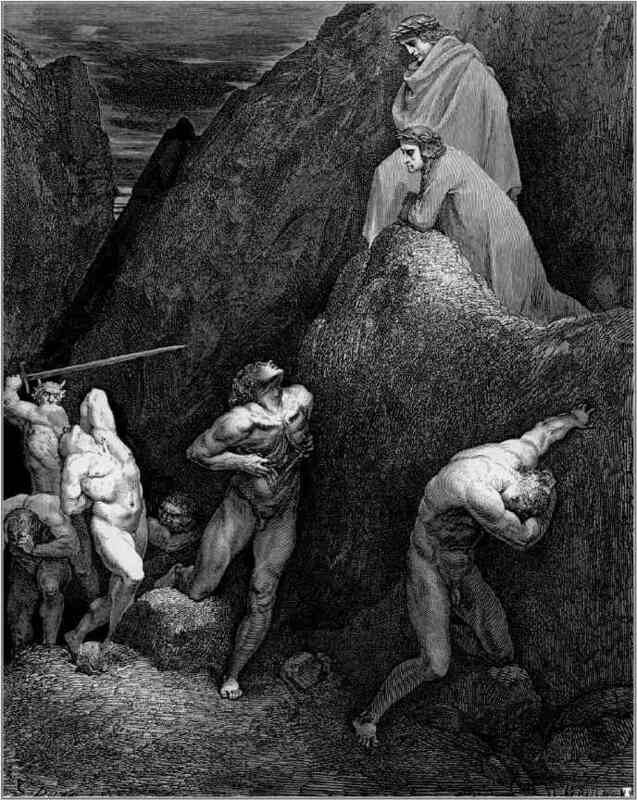 In Canto 28, Dante places Mohammed and his son-in-law Ali in hell, where they are constantly split for the sin of sowing dissension and heresy. 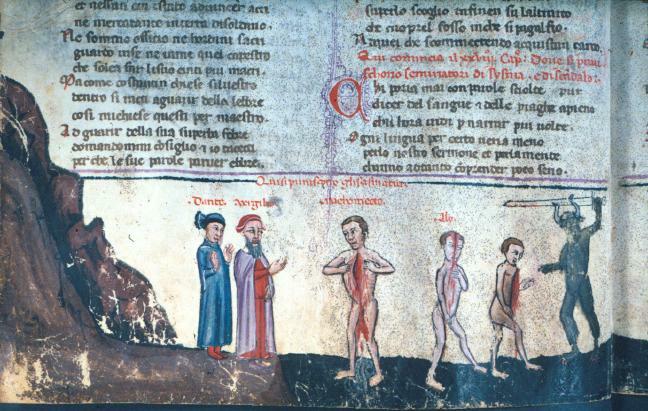 Islam was, in the time of Dante, considered a Christian heresy, with some believing Mohammad to be a renegade Cardinal who had created his own version of the faith. It wasn’t an unreasonable idea: most of what Islam has of value it took from Judaism and Christianity. his chest said, “See how I split myself! and scandal, and for this they now are split. I hope not. I wouldn’t wish damnation on anyone, and with God all things are possible. Even the perpetrators of yesterday’s slaughter are capable of being forgiven when, God willing, they are swiftly found and just as swiftly sent on their way to the afterlife. But as we face this endless war–and it is a war, with every computer and newspaper and city a battleground–we must not yield to intimidation and threats. And for now, that we means we must offend. Charles Dickens’ deep Christian faith rings in all of his works, and especially so in his Christmas books. 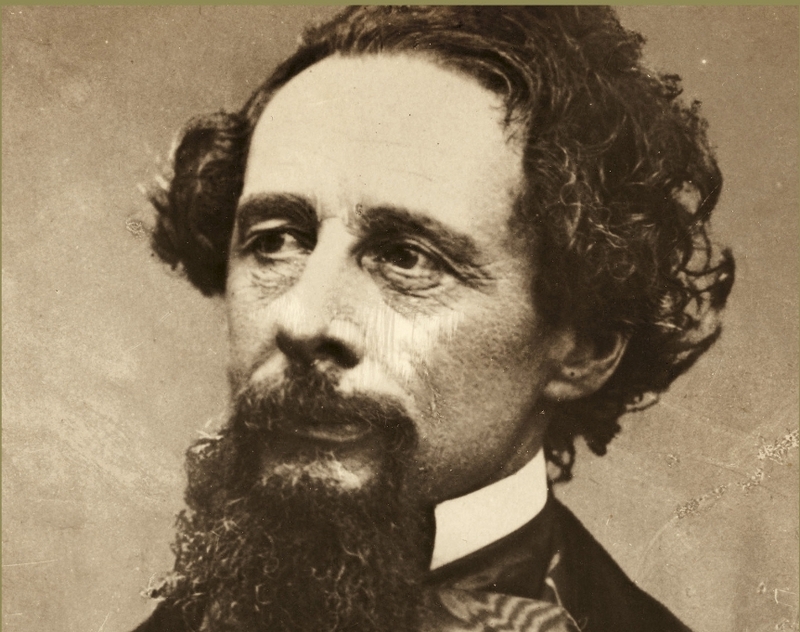 After the success of “A Christmas Carol,” Dickens published similar titles in the same format: novellas with supernatural elements and a clear Christian message. All of them were successes in their day, but none had the afterlife of “A Christmas Carol,” and few remember “The Chimes,” “Cricket on the Hearth,” “The Battle of Life” (the worst of the lot and, not incidentally, the only one without a supernatural element), and “The Haunted Man.” There are also a few oddball Christmas items to be found in the margins of his career, such as the fable “The Seven Poor Travellers,” which is bracketed by a nonfiction account of a Christmas celebration among the poor. I try to make a habit of reading (or listening to audiobook versions of ) some or all of the Dickens Christmas’ tales each year during the season. You need to take them as they are: occasionally mawkish (and what Dickens isn’t? ), melodramatic, and filled with certain stylistic tics. You also need to remember that these are sermons in story form. Scrooge is given a lesson in caritas. Certainly, his sin is greed, but it steams from a more fundamental cause: he has lost a sense of loving charity, which is the root of all Christian virtues. Scrooge’s conversion is not from a greedy man to a generous man. It is the story of a man who killed the love in his heart in pursuit of the world, and who gets that love back. “The Chimes” follows the exact same format. Instead of 4 “staves,” we get 4 “chimes,” each marking the quarter hour. Instead of a rich greedy man who is shown where his life as gone wrong, we get a poor man shown where the world will go wrong because of his despair. In place of a ghost and 3 spirits, we have the goblins of the church bells, their fairy attendants, and a haunting little girl. But “The Chimes” has a much harder edge to it. Trotty Veck, the central character, is a message-runner living in grinding poverty with his perfect daughter (Dickens always idealized women), who is eager to marry a young man despite their poor circumstances. Trotty’s sin is despair, which is indeed a mortal sin. The chimes–the church bells–stand for time, and symbolize the voice of God urging people to make the best of their days and have hope for the future. Striking every quarter hour, they remind the faithful of God, and the way that time passes according to His will. When Trotty hears the chimes, he hears hope and love. That “lost soil” is the soil of Eden, and the earth made to fashion man in image and likeness of God, which we cling to in our fall. It is the image of God in man. Trotty has believed the evil accusations leveled against him by the rich and powerful, and in doing so has joined them in their sin. It is the task of the goblins to show him the true path of despair, in order to set him back on the path of hope. After Trotty gives in to misery and self-loathing, Dickens delivers a powerful series of vignettes showing the horrible fall from grace of Meg and all those Trotty knows and love. Remember the moment in “A Christmas Carol,” when the Ghost of Christmas Present draws back his robes to reveal two feral children: Ignorance and Want? That moment has disturbed me since I first saw it in the Alaister Sim version as a kid. Well, Trotty’s lesson takes that moment and stretches it to chapter length, grinding Trotty’s face in scene and after scene of wretched squalor and misery. If you give yourself over to it and put aside the modernist tendency to sneer at Victorian melodrama, it’s potent stuff, almost intolerable in the way it careens towards a grim but inevitable conclusion. Since everyone knows “A Christmas Carol,” you know what’s coming in the denouement, but it doesn’t make these visions any less powerful. The Scrooges of this story don’t get their turnabout. It’s not about them. It’s about the grinding lot of the poor (particularly grinding in the time when Dickens was writing), our need to ease their lot, and the need of the poor to maintain hope in God in the face of the most wretched disappointments. You can read the story here, find a nice annotated collection of all the Christmas stories here, get the complete Dickens for Kindle here, or listen to Ruth Golden’s brilliant audio version here. I recommend the audio version. She does an incredible job, it’s free, and Dickens wrote these stories to be read aloud. Find more Quick Takes at Conversion Diary. 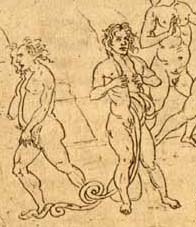 The article has many other examples of Auden’s secretive works of mercy. The History of the Catholic Church (James Hitchcock) as a quick review for upcoming comps for my masters. A good one volume overview. Doctor Thorne (Anthony Trollope): Third of his Barsetshire novels. Strange Histories: The Trial of the Pig, the Walking Dead, and Other Matters of Fact from the Medieval and Renaissance Worlds (Darren Oldridge) is a fascinating attempt to understand the medieval mind as it encountered the world, without condescending or assuming people were ignorant because they hold views many no longer accept. Beware of the Kindle version, which is missing text. Old Testament Pseudepigrapha: More Noncanonical Scriptures (by various hands) is a suppliment to the landmark collections by James Charlesworth, and includes more Jewish and Christian texts. What book did you finish last? Pickwick Papers (Dickens) was a treat to myself after finishing all my classes in December. Eifelheim (Mike Flynn). I took a break from Pickwick after Sean Dailey and Mark Shea badgered me to read Mike Flynn. An absolutely wonderful novel about aliens encountering a medieval village during the plague years. The way he completely understands the working of the medieval mind is astonishing. Church History, Volume One: From Christ to Pre-Reformation: The Rise and Growth of the Church in Its Cultural, Intellectual, and Political Context (Everett Furgeson ) is more comp review. Dombey & Sons (Dickens). Because Dickens. What book do you keep meaning to finish? The Way of a Pilgrim and The Pilgrim Continues His Way are wonderful works of Eastern Christian spituality, but I stopped midway and haven’t gotten back to them yet. Try the sample and you’ll be impressed. What book do you keep meaning to start? Don Quixote (Cervantes). I’ve never read it, and consider it a gap in my education. I picked up a new translation on Kindle, but I keep putting it off. What is your current reading trend? Theology, history, 19th century literature. Bonus question to bring it up to 7: What is the most important book you’ve ever read? More quick takes at Conversion Diary. More book lists at Darwin Catholic. Idea stolen from Unequally Yoked. Prior to the new discoveries, this fragmentary 3rd century papyrus (published in 2004) was the most recent addition to works of Sappho. “The new Sappho is absolutely breath-taking,” said Albert Henrichs, a Harvard classics professor who examined the papyrus with Dr. [Dirk] Obbink. “It is the best preserved Sappho papyrus in existence, with just a few letters that had to be restored in the first poem, and not a single word that is in doubt. Its content is equally exciting.” One of the two recovered poems, Prof. Henrichs notes, speaks of a “Charaxos” and a “Larichos,” the names assigned by ancient sources to two of Sappho’s brothers but never before found in Sappho’s own writings. It has as a result been labeled the Brothers poem by Prof. Obbink. UPDATE: Ashes From Burnt Roses has much more. From a letter, a beautiful metaphor for life and heaven. [T]ho’ we know what we ought to be; & what it would be very sweet & beautiful to be; yet we can’t be it. That is most sad, too. Life is a long Dardenelles*, My Dear Madam, the shores whereof are bright with flowers, which we want to pluck, but the bank is too high; & so we float on & on, hoping to come to a landing-place at last—but swoop! we launch into the great sea! Yet the geographers say, even then we must not despair, because across the great sea, however desolate & vacant it may look, lies all Persia & the delicious lands roundabout Damascus. *The Dardenelles is the Hellespont, a narrow strait leading to the Aegean Sea. Here’s a fine site for map lovers. Storytelling With Maps uses annotated maps to explain and teach. I found it through the interactive map of the journey of Odysseus, but there are plenty of other interesting ones as well, such as Santas Around the World and the flight of Wiley Post. They’re not deep, but they’re a good way to link facts and events to geography.